Kate Explains It All: Are My Property Taxes Going Up? Editor’s Note: Nashville, meet our friend Kate Dore. Kate runs a killer personal finance blog called Cashville Skyline. There’s been a lot of buzz about property taxes around here in the past few weeks that even we struggle to keep up with, so we asked Kate to drop in and help us figure it all out. Property Assessor Vivian M. Wilhoite and her staff have been making the rounds at neighborhood meetings to field questions about this year’s countywide property reappraisal. 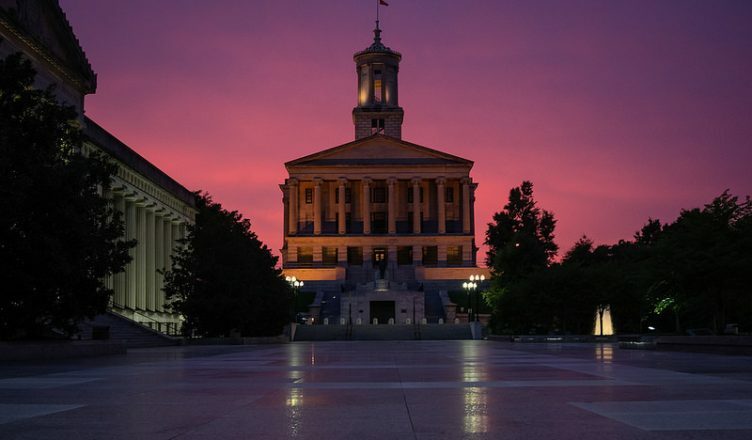 Even though the tax rate won’t be going up, as Mayor Barry confirmed this week, property reassessments will likely still result in some increases. A map revealing preliminary estimates of each district’s property value increases has understandably spooked some folks. Others aren’t sure what to expect, but know paying more for annual property taxes isn’t something they can comfortably afford. The best way to ease anxiety about increased expenses is to know exactly how much you are dealing with. 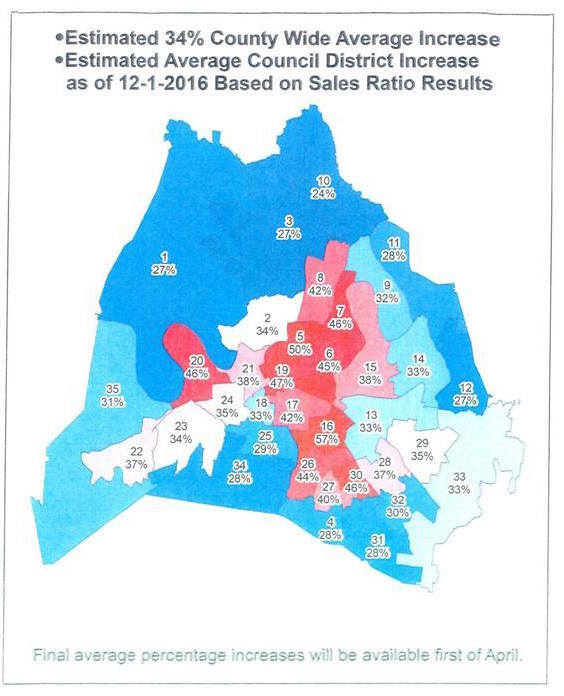 Here is what we know about Davidson County’s property tax increase and how to estimate its impact on your wallet. There is a calculator here if you don’t want to run the numbers by hand. Not sure if you live in the urban services district? This map can help. Where Can I See How Much I’m Currently Paying? You can easily search for your property through the Davidson County Trustee’s website. Once you have located your property, you can view a receipt of last year’s tax bill. There’s even a breakdown of how your 2016 bill was calculated. 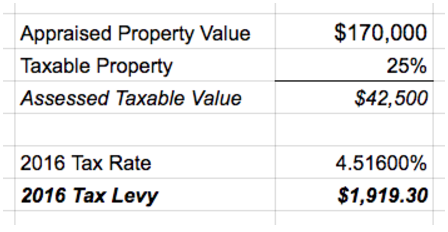 How Can I Estimate How Much My Property Taxes Will Increase? Using the calculator or formula above, simply type in a current estimate of your property’s value. According to the Nashville & Davidson Property Tax Assessor’s Office, we will be receiving a notice by mail in late April or early May. This notice will include our property’s new appraised value and step-by-step instructions on how to submit an appeal. Once the new property tax assessments and appeals have been finalized, the city will see exactly how much additional revenue will be coming in. From there, they will create an annual budget and decide on this year’s property tax rate. Yesterday, Mayor Barry confirmed Metro will not raise the property tax rate for Davidson County. Per Tennessee state law, local governments aren’t allowed to increase revenue as a result of a reappraisal, so the certified tax rate will actually decrease significantly. However, if the value of your home has increased more than the countywide average, you will still be paying more in property taxes. Does your mortgage have an escrow account? If so, your lender collects your property taxes every month as part of your mortgage payment. Then, your lender pays the city directly at the end of the year on your behalf. Your 2017 property tax bill won’t be sent until October, so you may not see any changes to your your monthly mortgage payments until the end of the year. The Property Assessor’s office has a number of neighborhood meetings scheduled through February. This is an opportunity to ask questions about the reappraisal process and how you should prepare. Also, Nashville Organized for Actions and Hope (NOAH) is holding a meeting on Sunday, February 19 at 3:00 PM at First Baptist Church in East Nashville to share information with the public about these assistance programs. You can learn more about NOAH’s affordable housing task force here.